We had a devil of a job packing for this trip, I mean, how on earth can we really know what we will need for a year away? We’ve guesstimated so many things, only time will tell if we have got it right. 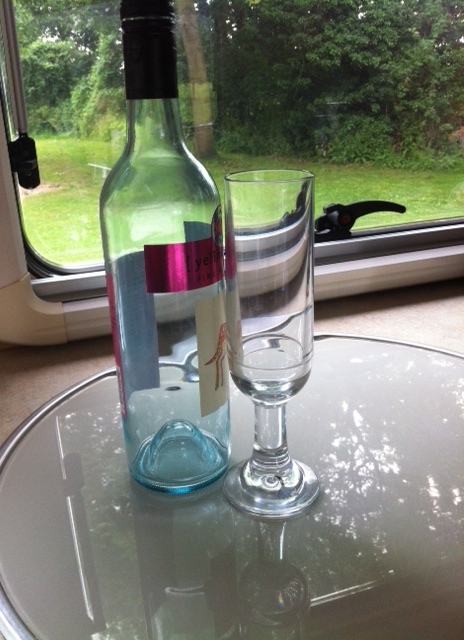 I have already noticed a couple of things that are missing, we have two champagne glasses and 4 large tumblers but we don’t have any wine glasses so maybe we need some little stubby glasses – that’d do the job nicely. As the title suggests I’ve been thinking today about the one thing I couldn’t do without (apart from the hubster and the dog!). 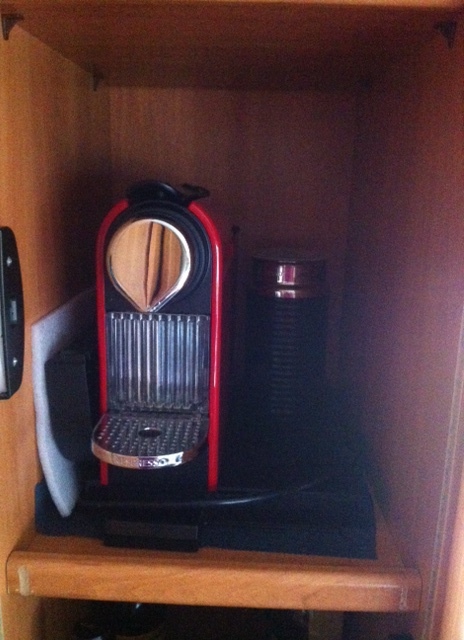 For me it has to be my espresso coffee machine! I just love my coffee! I know it’s a relatively, bulky, large item to bring but I drink so much coffee that it would surely cost us a small fortune if I were to have an espresso at café prices every day during our time away. And so my coffee machine is packed neatly in a little cubby hole and I have a selection of different coffee pods that I will look forward to drinking. Have a think, what would your one item be? We are normally surrounded by so many possessions that it’s difficult to see what is really important to us. I think meals will be a bit of a challenge, we have just three gas rings on a hob, no oven, no grill and no microwave, cooking on the hob in itself isn’t a problem but the gas rings are so close together that it makes it extremely difficult to fit more than one saucepan on at a time! Thankfully the hubster is an amazing cook and I’m sure will come up with some cracking meals. So far, as it’s been fine we’ve lived on salads and easy cook meals. Today I cheated and bought a precooked roast chicken from the supermarket and it was indeed scrummy. That’s my kind of cooking! This afternoon I’ve made it my mission to work out tyre pressures and weights…exciting life I’m leading at the moment. You see, if you’re not a “motorhomer”, you have a weight limit for each axel, and an overall weight limit, so our fully laden weight is 5500kg that includes everything we are carrying plus the driver, a tank full of fuel and the fresh water tank full of water. There are weight limits per axel, front and back. I’ve been down on my knees, crawling around under the steering wheel, in the passenger foot well, checking the inside of the doors, on the back of the drivers seat looking for the details. I eventually gave up and went outside for a cuddle with Charlie and lo and behold there fixed to the outside of the van is a plaque with all the details! Doh!! As for the tyre pressures, I couldn’t find them, there is a psi on the actual tyre but that isn’t the figure I need, according to the warden!! He’s recommended about 65-70 – not an exact science then!! I’m doing all of this because I’m hoping that soon we’ll be able to go on our first trip, We will head up to the north of England to say goodbyes to friends and family, before coming back down to the south of England to tie up any loose ends before taking to the road proper. I’m so excited and yet at the same time extremely nervous. I do hope that we will manage this van, it seems incredibly large when sat at the steering wheel, I think it’s partly due to the fact it has the most huge panoramic window, it’s a little bit like being in a fish bowl!. I will leave you with a couple of shots of today’s view out of the window. 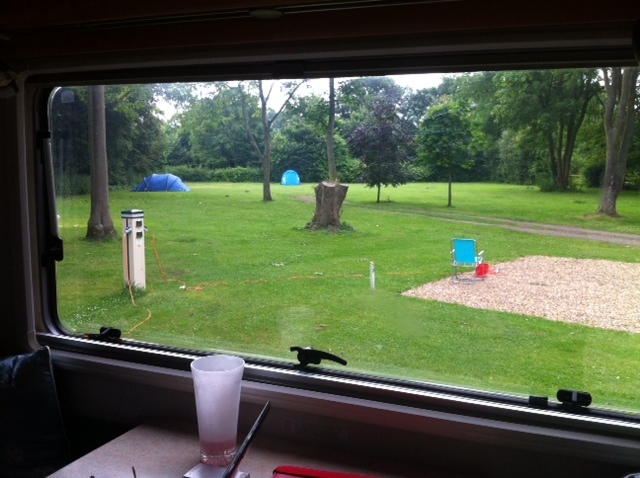 Although this campsite has 200 pitches it’s lovely and quiet where we are. 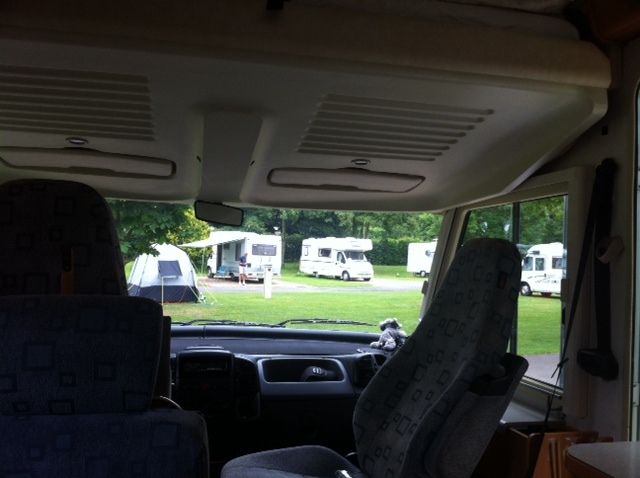 This entry was posted in Daily life, England, Hidden Gypsy, Hymer, motorhome, motorhoming, Photos, Thoughts and tagged camping, campsite, happiness, Hymer, luxury item, motorhome, motorhoming, Thoughts, tyre pressure., weights. Bookmark the permalink. 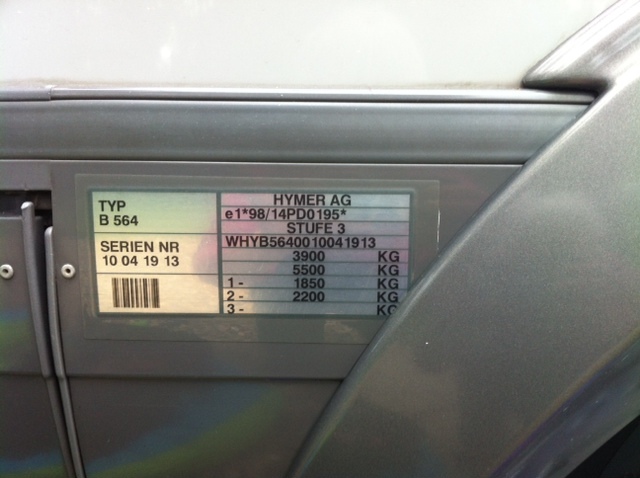 Seeing as you haven’t yet driven further than the campsite amenities area I really hope that the Hymer lives up to expectations when you start your epic journey and that the fuel costs are not extortionate oh and that everything stays in place when you encounter your first roundabout! Would love to meet you before you leave but with work etc I guess that will be a bit difficult. I look forward to reading your updates via this blog and Facebook. Oh Steve, if you hope that, imagine how we feel!! It’s really quite nerve wracking! I’ve been researching this idea for over two years, that’s when I got this brainwave:) I’m sure we’ll be fine, we adapt quite easily, but if we had to stay here for a year – I’d be happy lol!! I’ll make sure to batten down the hatches before we drive off and cross fingers. Yes it’d be good to meet but if we don’t – do keep in touch, I want all your news about the new venture. The thing about adventures is that whilst you enjoy the sights and sounds of new places, you also get to scoff down some yummy local cuisine, which means the cooker can take a break more often than not!